Today, I am sharing with a recipe that is often prepared for Ramadan and Eid time in a Middle Eastern household! 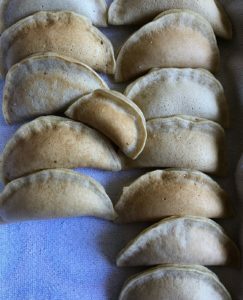 It’s a dessert thatsi extremely popular, irresistible and its shaped like an empanada! What can it be? Atayef, is a delicious baked treat usually filled with nuts or cheese but people get creative and fill it with nutella and other things too. 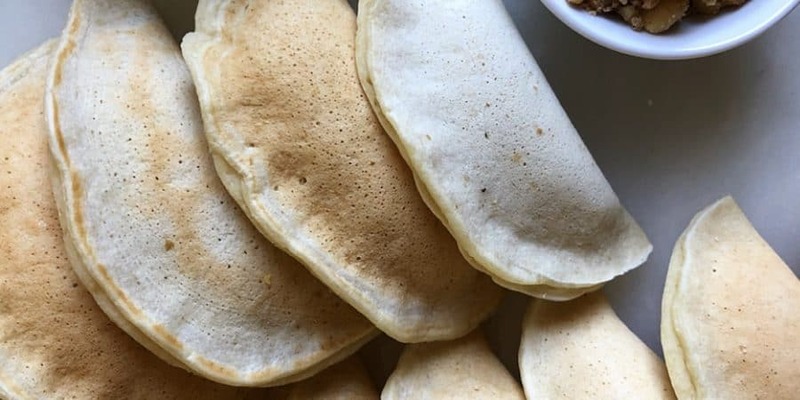 Atayef, for those who don’t know, literally looks like a pancake except its porous and thinner than your average pancake. 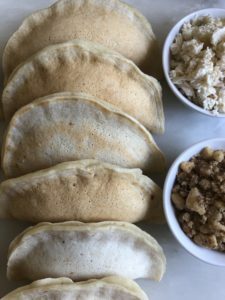 Atayef are nostalgic to me; its something I remember making with my parents growing up and being super excited about it too! I always couldn’t wait till that time of year; my favorite job was eating the baby atayef that was left over from the batter with some honey! For those who don’t know, I share with you how to make this through videos on my Instagram highlights section. You can check it out there @fufuinthekitchen. I hope you all enjoy this recipe as much as my family does. Some of you have made it already and love it, which makes me so happy! Stir the above ingredients all together in a big bowl using rubber spatula or hands and let it rest for 15 minutes. If batter appears too thick then add more water to it and stir till you get the consistency you want. (I ended up using almost 3 cups of warm water instead of 2 1/2 but it really depends what flour you use). So, start with 2 1/2 and see if you need more. Heat the pan or griddle you will be using. Ladle thin layer of batter onto a nonstick pan or griddle and cook on low to medium heat. You want them the size of pancakes but not as thick. You should see pores developing on the atayef. Once batter is completely dried from the top of the atayef then it is ready to be taken off the heat and placed on a towel to cool off. Keep repeating the same step. It shouldn’t take more than a minute or so to cook one atayef. *Make sure not to stack them on top of each other unless completely cooled off. Crumble the cheese with your hands and mix with the cinnamon and sugar in a bowl. Add all the above ingredients together in a small pot. Stir for a few minutes. Let it simmer over medium heat for 15 minutes till liquid becomes sticky. (*It will not be a thick syrup but will become thicker when storing in fridge afterwards). Take your cooled atayef (pancake) and add about 1-2 tbsp of filling in the center depending on size of atayef. Make sure not to over stuff to avoid atayef from opening up when baking but you do not want to be skimpy either! 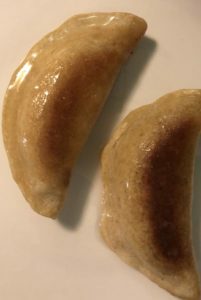 Then, bring both sides of the atayef together to form somewhat of an empanada shape. Make sure to seal it well. Go over the edges twice to ensure its closed well. You can store the atayef in a baking pan covered with a towel really well and maybe even a plastic bag then put in the fridge for a few days. When ready to bake, preheat oven to 400 F.
Lay the atayef on an oiled baking pan leaving them 2 inches apart. Also, spray or brush the atayef with oil at the top before placing in the preheated oven. Bake for about 15 minutes on 400 F. The broil each side of the atayef for 1-2 minutes to achieve some crispiness and browning. Then, take your hot atayef and place it in the syrup (cooled), toss it around a little bit and take it out to plate.